Sicily’s most famous wine, Marsala, was first made in the city of that name on the western coast by the Woodhouse firm, which also sold Port. Like its sisters Port and Sherry, Marsala is a fortified wine with an alcohol content of around twenty percent. It is usually made from native Grillo, Catarratto, or Inzolia grapes. John Woodhouse established his winery at Marsala in 1796. Benjamin Ingham founded a competing firm in 1812, followed by Vincenzo Florio, a Calabrian, in 1832. Larger vintners such as these have always dominated the Marsala wine trade, though smaller firms have entered the field in recent years. They’ve brought a welcome family spirit to the industry, which in the last two decades had fallen under the aegis of larger corporate entities. For more than a century, Marsala was the equal of Sherry and Madeira, if not Port. By the 1950s, however, it found itself relegated to the kitchen as cooking wine, and competition came from unorthodox quarters, with the introduction in the United States of a watery “California Marsala.” In 1986, the Italian Republic’s D.O. (denomination of origin or appellation) laws for Marsala were revised to incorporate stricter regulations similar to those which the Portuguese government instituted for Port (a somewhat heavier wine), and Marsala is now resuming its place as a dessert and aperitif wine. Today’s Marsala is often divided into three different standards, namely oro (golden), ambra (amber), and rubino (ruby). Some marsala makers prefer to categorise it according to terms used for Port wine, such as tawny. There are both sweet and dry types, and various categories (of which we’ll mention just a few). “Fine” is aged for a minimum of one year, while “Superiore” is aged for a minimum of two years (some vintners age it for three years). “Superiore Riserva” (often simply “Riserva”) is a vintage wine aged in wood for four years, and sometimes as long as six. “Vergine” is aged in wood for a minimum of five years (some firms age it in small oak casks for as long as seven years). For cooking, there’s even a Marsala made with the addition of egg white (though you probably won’t notice this ingredient). Truth be told, there are dozens of kinds of Marsala wine, some unique to certain houses, each meeting particular standards. Some estates age it in oak casks from the 1860s, making your Marsala experience a piece of Sicilian history. (A number of firms produce exceptionally good Marsalas; Florio offers the widest range of types.) Marsala shouldn’t be confused with other sweet Sicilian dessert wines of amber colour. Passito, described below, is not a fortified wine. 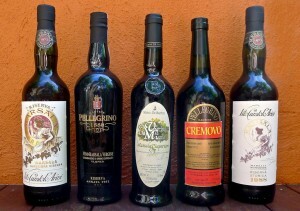 Some pleasant Marsala liqueurs have also been introduced, though they’re difficult to find on the market. Florio makes a fine brandy, and several firms make almond-flavored Marsala, best described as Sweet Marsala with a touch of Amaretto, though it’s much more than that. Sicilian egg nog (zabaglione) is made with Marsala. Purists will tell you that Zibibbo is a grape variety that can be used to make anything from table wine to grappa. However, the Zibibbo made commercially by several houses is a strong wine similar to Marsala but fermented and then partially distilled naturally, without the addition of spirits. The process differs also in that Zibibbo is actually made from grapes partially fermented in the sun. It is a very old process, and Zibibbo, though not the direct precursor of Marsala, derives from a formula known in the Middle Ages. It is typically slightly lower in alcohol than Marsala (about fifteen percent compared to eighteen or twenty percent) and sometimes more robust. The Zibibbo grape is similar to Moscato, and the wine known as Moscato di Pantelleria Naturale is made mostly from Zibibbo grapes. The Primitivo grape is rarely used by itself anymore. Some fascinating genetic research in California indicates that the grape Americans call Zinfandel is actually Primitivo, a Sicilian variety that may have been introduced by the Albanians who settled certain Sicilian communities in the sixteenth century. It was probably taken to California in the eighteenth century by Spanish colonists or later by Sicilian immigrants. Several liquors unique to Sicily are worthy of mention. Ala, made by Florio, has a distinct flavor, as does Averna, which is made in Caltanissetta. Fichera, a newcomer, is made near Mount Etna. There are also several mildly fortified almond-flavored white wines which, though not suitable for every occasion, go well with some desserts. Several Sicilian liqueurs are similar to those produced on the mainland, namely limoncello, from lemons, anisette and amaretto. There are others, such as the interesting liqueur made from prickly pears (cactus fruits) and Cynar (from artichokes). Grappa is actually a brandy distilled from grape seeds and pomace. Dry and high in alcohol, it is usually white and served as an after dinner drink. In Italy, grappa is often sold in artistically original clear glass bottles which the distillers commission specially for this liquor. Moscato is difficult to describe. It comes from the Muscat grape, of course, or from the sub-variety known locally as Moscatello, sometimes with the addition of Corinto or Zibibbo. 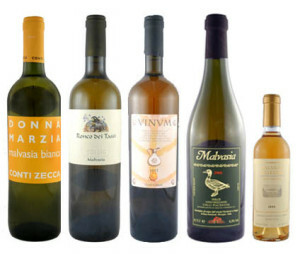 Some fine whites can be made from Muscat, but in Sicily and the nearby islands it is usually rendered as a golden or light amber dessert wine (popular with biscotti on St Martin’s Day), sometimes fortified or even sparkling (spumante). A few localities are famous for Moscato. Moscato and Moscato Passito are made by some distinguished wineries on the islands of Pantelleria and Lipari. As its name implies, Moscato Passito contains Appassito grapes. By tradition, vintners use a special “dry” process in production of Passito, so semi-dry grapes and even raisins find their way into the must. Unlike Marsala and Port, to which alcohol may be added, Passito is not a “fortified” wine. This brings us to the point that Passito refers as much to a winemaking process as to a specific grape variety. The areas around Siracusa and Noto, in the eastern part of Sicily, also produce fine Moscato wines. Malvasia is another white grape used to make a strong varietal that is golden to amber in color and slightly fortified. Bred from an older grape variety, Malvasia is grown in northeastern Sicily (near Messina) and on the island of Lipari, where it is used in the making of a wine somewhat similar to Moscato. Carricante (Catanese Bianco). A white from the Etna area. Cataratto Bianco. A white traditional in the Trapani area and used in Marsala wine, characterised by a delicate flavor and medium alcohol level. Frappato. Strong red of uncertain origin grown in southeastern Sicily. It is genetically very similar to Gaglioppo (see below). Gaglioppo. A red of Calabrian origin frequently grown in Sicily. Similar to Frappato. Grecanico (Greco). A white so-called for its Greek origins. Genetically very similar to the Garganega grown in Veneto. Inzolia, Insolia or Anzolia. Used to create dry white table wines, either as a varietal or blended with varieties such as chardonnay. Malvasia. 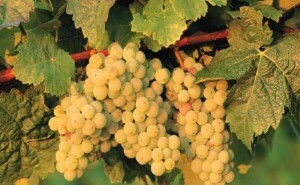 A muscatel sub-variety used to make the wine of this name, but the term more properly refers to the Moscato grape (see below). Moscato. Muscat, a traditional variety widely used in Italy, in Sicily associated with the dessert wine of this name, simlilar to Malvasia. The muscatels are one of European winemaking’s most widespread grape types. Nerello. Strong red grown in two varieties, Mascalese and Cappuccino. Nero D’Avola (also called ‘Calabrese‘). Hearty red used in some of Sicily’s most popular wines. Perricone (Pignatello). Esoteric, robust red. Primitivo. Traditional red, probably Balkan in origin, original stock for the “Zinfandel” of California, to which it is genetically identical. Nowadays it is rare in Sicily. Zibibbo (Moscatellone). 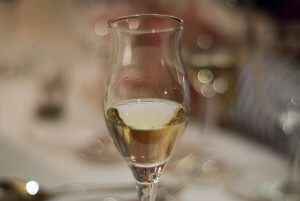 White (a variety of Muscat of Alexandria) possibly introduced in Sicily by the Saracen Arabs during the ninth century, used in fortified wines and alone. Sicily’s muscatel mainstay. Purists will tell you that Sicily has but one traditional wine region. Today great wines are produced around Sicily. A number of Sicilian wines are defined by denomination of origin (or “appellation” abbreviated D.O. or D.O.C.) as indicated on our map of wine regions. This obviously includes Marsala (usually made from a blend of several grapes), as well as the fortified Moscatos, Passitos and Malvasias (of which there are various recognised types based both on location and the grape varieties used), but also wines such as Alcamo, made in the locality of that name in the province of Trapani from Catarratto and other grapes, usually Damaschino or Grecanico. Cerasuolo di Vittoria is made in the province of Ragusa from Frappato and Calabrese, with the addition of Grosso Nero and Nerello Mascalese. Etna Whites, produced near Europe’s largest active volcano, are usually made from Carricante and Catarratto, with the addition of Trebbiano or Minnella. Etna Reds and rosés are made from Nerello. Faro (the name means “lighthouse”), as its name implies, is typical of the area around Messina. It is a Red made from two different Nerellos, as well as Nocera and Calabrese, with the addition of Gaglioppo or Sangiovese. Regaleali, made by Count Tasca, is not recognised as a D.O. wine, but the vineyards where its grapes are raised are so well known that this former fief is indicated on some Sicilian maps, and Regaleali is preferred by most Sicilians to less distinguished D.O. wines like Alcamo and Etna. This brings us to an important observation, namely that, for most Sicilian wines (Marsala being an exception), “denomination of origin,” or appellation, is a meaningless designation unrelated to quality. Often, the system is abused to “dignify” otherwise mediocre wines with a particular geographic identity as though they were Burgundy or Bordeaux. Novello is Sicily’s nouveau vintage wine, sold annually just months after the grapes are harvested and pressed. It is usually robust and fruity. You’re not likely to find it outside Sicily. Sicilian vintners offer a range of vintage D.O. wines which are not varietals. Though Sicily is not famous for its sparkling wines, a few are made here. Castelmonte Frizzante, which is naturally effervescent, is similar to Spumante. A number of small wineries have emerged in recent years, but in many cases they have been producing wine for decades. In the 1990s, a number of grape producers whose product (grapes, must or wine) formerly supplied the Marsala industry, or was used to fortify weak French or northern Italian wines, began to make their own varietal wines for an increasingly sophisticated consumer market. These wineries now produce some of Sicily’s best wines. However, the recent popularity of Sicilian varietal wines (particularly the reds), and government subsidies for wine producers, has encouraged lawyers, doctors, haberdashers and other non-vintners to make wine for sale, usually with mediocre results. These should not be confused with the wines offered by various small but distinguished family-operated wineries. To outsiders, it’s not always an easy distinction. When Italians speak of “il vino della casa,” they usually mean “house wine” in the sense of the wine that a restaurant or farmer has made from local grapes, and images come to mind of strong home-made red wine that tastes like vinegar. Among Italian vintners, however, mention of a “casa” (literally “house”) is like a French vintner referring to a chateau, and in Italian aristocratic parlance a “house” is a noble family. Some of Sicily’s best houses make excellent wines that don’t officially make their way to the consumer market, often because the quantity of a few hundred bottles is not sufficient to justify an advertising or sales campaign. These rare vintage wines are among Sicily’s true treasures. Apart from these, some family firms have emerged which offer some exceptional wines.